Australia's famed collection of oversized attractions has just gained a new addition, with the much-hyped arrival of The Big Melon in Chinchilla, Queensland. This latest 'Big Thing' takes the form of one very juicy looking watermelon, very much at home in the town long known as the 'Melon Capital of Australia'. Chinchilla's biennial Melon Festival helped rocket the town to victory in a recent nationwide competition by travel site Wotif, in the hunt to find the location and giant-sized star of the country's next 'Big Thing'. Following thousands of submissions from the public and a pretty fierce voting process, the Big Melon claimed victory over fellow sizeable finalists, Glen Innes' Big Kilt (NSW), Mittagong's Big Tulip (NSW) and the Big Peanut in the Queensland town of Kingaroy. Chinchilla's fruity new arrival clocks in at over three metres tall and almost nine metres wide, taking pride of place at the town's Visitor Centre. It joins a group of over 150 towering landmarks dotted throughout the country, from longstanding icons like the Big Pineapple (QLD) and Big Banana (NSW), to more recent additions including the Big Olive (SA) and the Big Ant (SA). 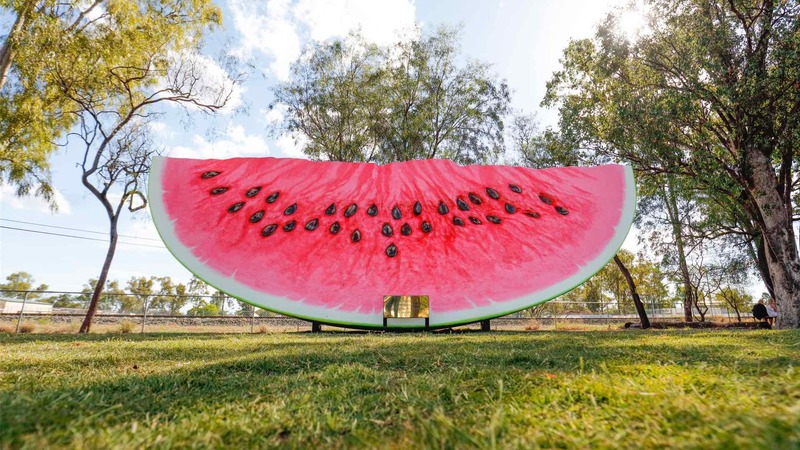 The Chinchilla Melon Festival regularly pulls over 15,000 visitors from all corners of the globe, with the 25th anniversary edition happening from February 14 to 17, 2019. The event features a jam-packed program of melon-inspired revelry, from melon 'skiing' and a melon race, to a melon-eating competition and a melon bungee fling. There's even a festival weigh-in to find the area's heftiest melon — a title which looks to be a shoo-in for the town's new oversized landmark.